KARA TANNER WALKED a trail of dirt and stone blocked in by clumps of needle-thin grass, thorny yellow weeds, and sprawling patches of clover. The Lorilan Forest had never felt as empty as it did now. The late afternoon sun cut through the overgrowth, fingers of light on a carpet of leaves. Every patch of shadow felt like a threat. Kara was almost to the Thinking Trees, and her heart hammered in her chest. Those trees could kill her and would, if it suited their fancy, but they had what she needed to save her mother: a single glowing acorn ripe with Life’s energy. Just the thought of watching Ona die in bed brought a lump to her throat. Kara picked her way through giant gray cedars, wide enough to offer passage but close enough to scatter the cold wind. Their branches rustled and shivered. A redbird called from above, a low, hopeful warble, but no others answered. It sang alone. Kara adjusted her gray cloak and remembered Ona hugging her, Ona setting a splint, Ona singing her to sleep, each word soft and perfect. She pictured her mother’s smiling face until her pounding heart slowed. Ona had raised Kara all but alone while her father sailed away on long voyages — Rance Tanner worked on trading ships for months at a time — but her mother had never complained. Kara had to save her. The wasting disease now eating her mother away grew more painful each year. Ona did not have many years left. At last the cedars thinned, vanished entirely, and only open brown ground remained. The Thinking Trees clustered in a grove all their own, surrounded by a circle of dead earth. 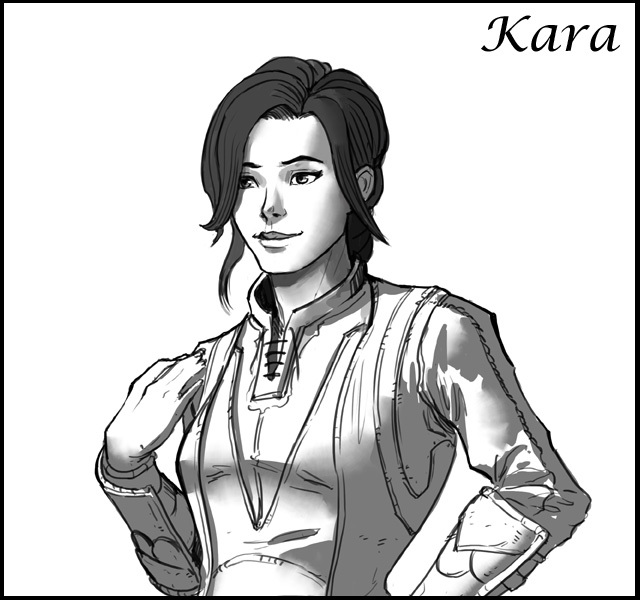 As Kara entered the circle, her skin tingled and hairs rose on the back of her neck. The Thinking Trees were taller than the cedars, and vines of purple ivy wound around their bright brown trunks. Those trunks were smooth, unnaturally so, and the first sprouting branches hung higher than the tallest building at Solyr: the magic academy where Kara had lived and studied for almost twelve years. The tingling on Kara’s skin intensified, like a hot sun beating down. She felt an overwhelming compulsion to collapse and die, sent by the massed minds of the Thinking Trees, but she clenched her fists and stood her ground. She did nothing else. If she threatened these trees in any way, they would paralyze her with their ancient minds. She would nourish their roots with her decaying body, tan skin rotting off white bones. Kara pushed the threatening image aside and waited, endured. After a time, the tingle faded. She took that as permission. The trees would hear her plea. Kara pulled back the hood of her initiate’s cloak, knelt before the Thinking Trees, and brushed a clump of brown hair from her eyes. She stretched her slim frame forward and dug her fingers into the cool earth — a tree planting roots. She took the dream world. In the world that existed inside her closed eyelids, a meshwork of jagged brown lines formed the ground and extended to the smooth yellow grid of the sky. Vibrant orange lines formed the massive trunks of the Thinking Trees. Just beyond the circle of dead earth, a few brave stalks of orange grass swayed in the wind. Holding the dream world was like trying to flatten a flag in a stiff wind. Kara did it better than most. Everyone in the Five Provinces who wielded magic looked into the dream world as they scribed glyphs in their own blood on the ground, the air, or themselves. Here, they drew on the Five Who Had Made the World to change it. Kara drew a hand free and sliced one finger open with her sharpened thumbnail. She scribed a single formless glyph in her own blood on the empty air, a glyph of idea: a concept sent from one mind to another. A baby clutching its mother. The trees offered no response, so Kara scribed another idea glyph: two merchants brokering a deal. The aura of the closest tree shifted, and that gave her hope. She would find no sympathy from a Thinking Tree, but she might find a trade. Kara scribed another idea glyph, a single glowing acorn. The tree then tugged at her mind, a feeling like cool air slipping in through her nose. It wanted inside, and would already be inside if Kara’s studies at Solyr had not trained her to block such intrusions. She stopped resisting. She opened her mind to the Thinking Tree, even though that felt as wrong as taking water into her lungs. She offered absolute trust. Once inside her head, this tree would own her. She would be a puppet and it the puppeteer. It demanded this price, and she could pay it or leave. She was not leaving. Kara’s head pounded, and her vision swam. The tree rummaged through her memories, everything from her first steps to her first kiss to her most secret dreams. It drank her life’s experience as a hungry tick would drink her blood: impatient, eager, and rough. The throbbing in her head grew to dozens of hammers slamming the inside of her skull, a cacophony of breaking rocks. She endured. She remembered Ona’s pained cries. The Thinking Tree peered at every memory she had, felt everything she had ever felt, poked at every decision she had ever made. When it knew her better than she knew herself it finally withdrew, sated. After it consumed her life. Needles poked at the inside of Kara’s eyes. She was powerless before this tree, and that realization chilled her. She could really die here, helpless, in these woods. Only a fool would think to bargain with an entity as ancient as this. A glowing acorn landed with a quiet thunk. The tree had honored their bargain, and Kara had trouble believing it. The acorn was scarcely bigger than her thumb, but it was real. The Solyr history had not lied. One could bargain with Thinking Trees. Even something as ancient as this tree still longed for life experience beyond its roots. The skin she had sliced healed over as it always did, resealing itself once she completed her blood magic pact. Kara crawled forward and picked up the acorn. She tucked it into the small pouch hidden inside her shirt and crawled out of the circle, backward. Her arms and legs ached by the time she reached the edge. Only then did she dare rise. She left the dream world, brushed herself off, and turned to find a large man standing right behind her. She unslung her quarterstaff and dropped into a low guard, staff raised above her head and tip slanted down. “Halt!” Her reflexive action did nothing to stop the tremble in her arms. She hoped he wouldn’t notice. Her stalker was far too tan to be a northlander, shorter than she was and built like a bear. His long black hair hung about his face and brushed his shoulders. Pale blue eyes peered from beneath bushy black eyebrows. A thin beard surrounded his mouth, but all that paled in comparison to the blood. So much blood. He wore more blood than Kara had seen on any living man in the whole of her life. Some oozed from a wound in his scalp while more stained his damp shirt bright red. His left knee bent wrong, yet he stood with little trouble. He stared at her with eyes that were like those of a corpse, unfocused and empty. His voice was soft and free of menace, with a hint of huskiness common to Tellvan peddlers. It came from years of breathing desert sand. There was no love lost between Tellvan and Mynt, Kara’s home province for every one of her eighteen years. “Demons, is it?” This man was as mad as a sunbaked sailor, but he had not attacked her. A good sign. Kara slung her quarterstaff over her shoulder with its attached leather strap. A twig snapped, near enough to echo, and Kara unslung her quarterstaff and scanned the distant cedars. Something or someone waited out there, and if it had done this to this poor man, what would it do to her? Break her legs? Bash her head open? What did it matter? She would not leave this man to die. Yet when she heard howls rising on the wind, she briefly considered it.